David showed us some nice hol­i­day slides, but they needed con­text and an accom­pa­ny­ing map to show us the loc­a­tion of the places vis­ited. Nor was there any men­tion of the Rohingya troubles. 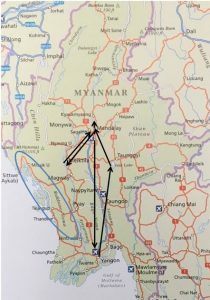 I have there­fore con­sul­ted the excel­lent DK Eyewitness Travel book on Myanmar to fill in some gaps, and par­tic­u­larly to cor­rect some of the spellings and decode some of my barely legible blog notes. Myanmar (Burma) bor­ders Bangladesh, India, China, Laos and Thailand. It has tower­ing gilded pago­das, spec­tac­u­lar arche­olo­gical sites, great beaches, stun­ning moun­tains and tra­di­tional cul­ture. It was opened up to tour­ism in 2010 with San Suu Kyi’s suc­cess in the gen­eral elec­tion. My 2016 DK guide adds “the future finally looks bright …after dec­ades of civil war.” Maybe less so now.The Bamars (70 per cent) dom­in­ate a diverse minor­ity ethnic pop­u­la­tion includ­ing the Muslim Rohingya (30 per cent). Other con­stants are Buddhism, and sup­port for the sangha (monk­hood). Half a mil­lion in claret robes work part time in mon­as­ter­ies from the age of seven. There are some 75,000 nuns. Tourism just about keeps the eco­nomy going. First stop, Yangon. It’s a mix of (par­tially run­down) colo­nial charm and high rise chic five-star living. The Sule pagoda was rebuilt in the 14th and 15th cen­tur­ies and has a huge octa­gonal stupa (tower), covered in gold leaf with bamboo scaf­fold­ing. Yangon’s traffic is chaotic, and get­ting to the other side of the road is a fairly risky busi­ness. Next stop was Heho air­port for the Inle Lake. One hun­dred thou­sand Intha people live in stilt houses around the lake. Many of them fish with large con­ical nets, pro­pelling them­selves with one leg on the tail of the canoe using the other as a ful­crum on the oar behind. Some of this may be for the bene­fit of tour­ists and there­fore prof­it­able. Fruit and veg are pro­duced in float­ing gar­dens, anchored by bamboo poles. Fried tree ants and crick­ets are a must. Setting the scene are mul­tiple mon­as­ter­ies, stupas and pago­das (ladies some­times pro­hib­ited), hand-loom fabric and silk pro­duc­tion, cigar rolling, boat-building using simple hand tools, girls on motor­bikes, melons, sacred cows, mopeds and stray dogs (which don’t bite but rabies wasn’t men­tioned). I was puzzled by the lookalike Scots in tartan and the alle­gi­ance to Arsenal. I couldn’t quite work out where David had trav­elled by train apart from being on Nyaungshwe sta­tion where there were health and safety issues with exposed mains cables and a train fare hike for for­eign­ers. You have to exper­i­ence at least one Burmese rail jour­ney, and the slow train from Shwe Nyaung to Aung Ban (Kalaw) is recom­men­ded. Initially built as a cen­tury hill sta­tion by the British as a summer retreat, it has an agree­able cli­mate and remains full of dilap­id­ated grandeur. Large Edwardian houses are remin­is­cent of S10. On one of the slides, there was a splen­did mock Tudor one that looked very famil­iar Trekking through ter­raced fields, tea plant­a­tions, forest and sub­sist­ence farm­ing com­munit­ies in the sur­round­ing hills is pop­u­lar and David clearly enjoyed this. A cart ride to Inwa saw ancient ruins, brick and gilded stupas, mul­tiple other intact stucco and teak mon­as­ter­ies, all in paddy fields and banana groves. An intact bit of a palace, almost com­pletely des­troyed in an earth­quake in1839, is Myanmar’s own lean­ing tower of Pisa. The Ayeyarwady River runs south and gets increas­ingly silty (agri­cul­tural lifeblood) for 1,250 miles from the Himalayas to the Bay of Bengal, mil­lions depend­ing on it for their live­li­hood and crop irrig­a­tion. Since ancient times it was a stra­tegic link between China and the Indian Ocean. A gentle chug up-stream from Mandalay for an hour gets you to Mingun where the unfin­ished giant stupa built by King Bodawpaya is the most strik­ing monu­ment of the whole river. Bagan is one of Myanmar’s greatest archae­olo­gical sites. There are numer­ous medi­eval city rem­nants from Bagan’s empire days from the 11th to 13th cen­tur­ies, with over 2,000 temples, stupas and mon­as­ter­ies, some of which were seen by David — a superb spec­tacle rising up from the dusty sand flats. We saw an impress­ive aerial view from a great height in a hot air bal­loon in one of the slides, but shock horror — David con­fessed it was pinched from the inter­net.